Police • Five months after woman's death, shooting review is moving forward. Courtesy photo Danielle Willard, 21, was shot and killed Nov. 2 by West Valley City Police detectives during an investigation at an apartment complex. On March 21, 2013, WVC police identified the two officers who shot Willard. Courtesy photo Danielle Willard, 21, was shot and killed Nov. 2 by West Valley City police detectives during a drug investigation at an apartment complex. Police have identified the officers who shot Willard, but will not confirm that one of those officers is involved in 19 unrelated criminal cases that have been dismissed because of evidentiary problems. 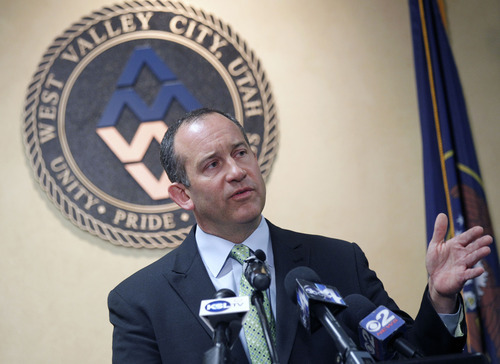 Al Hartmann | The Salt Lake Tribune West Valley City Manager, Wayne Pyle speaks at a news conference Wendesday March 27 in conjunction with the police department. Al Hartmann | The Salt Lake Tribune West Valley City Manager, Wayne Pyle speaks at a news conference Wendesday March 27 in conjunction with the police department. 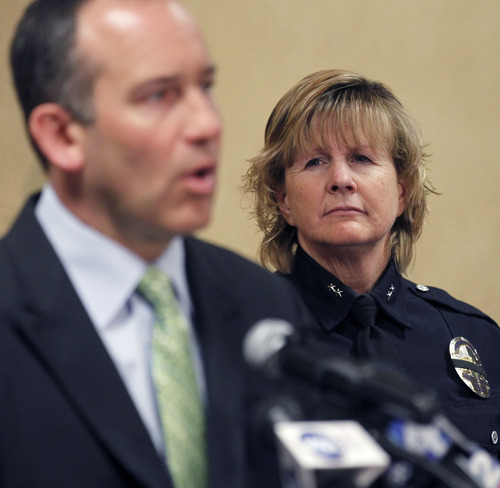 Al Hartmann | The Salt Lake Tribune Acting West Valley City Police Chief Anita Schwemmer, right, listens to West Valley City Manager Wayne Pyle speaks at a news conference Wendesday March 27 . 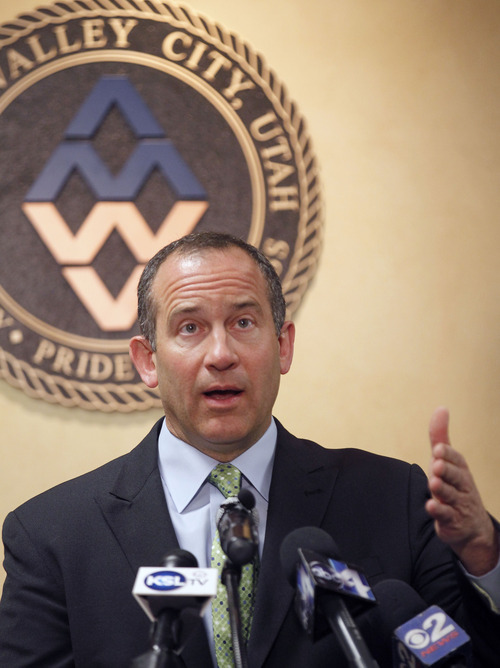 Al Hartmann | The Salt Lake Tribune West Valley City Manager, Wayne Pyle speaks at a news conference Wendesday March 27 in conjunction with the police department. 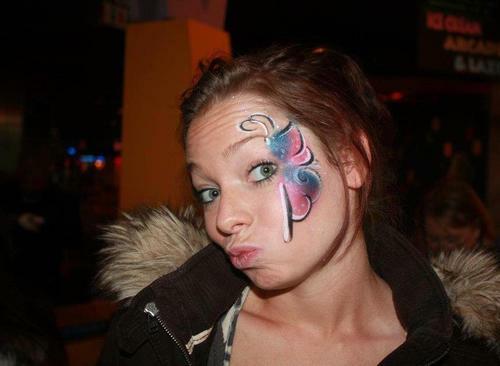 West Valley City• City officials conceded Wednesday they should have been more forthcoming to the public about the investigation into the death of 21-year-old Danielle Willard, who was shot to death by plainclothes West Valley City police detectives during a drug-related bust. And officials said they hope to be more transparent in the future. "We certainly, looking back, would probably have done things a little bit differently in the beginning of this incident," city manager Wayne Pyle said during a news conference, adding that more information should have been released earlier on. "I think that possibly might have quelled a lot of the questions that arose, right off the bat." Meanwhile, as the Salt Lake County District Attorney&apos;s Office begins the process of reviewing the fatal shooting, it also has been involved in a separate probe into a West Valley officer that led DA Sim Gill to seek the dismissal of 19 cases. Gill confirmed Wednesday that his office was investigating five incidents of alleged criminal wrongdoing by an unidentified WVCPD officer related to the dismissal of the 19 cases. Gill said his office is being assisted in probing those five incidents by the Salt Lake City Police Department, which was called in as an independent agency. While Gill has not publicly confirmed as much, it is believed that Detective Shaun Cowley, who also was involved in the Willard shooting, was the officer in question that led to the dismissal of the mostly drug-related cases. The Utah Fraternal Order of Police has denied that Cowley is guilty of any wrongdoing. The Salt Lake County District Attorney&apos;s Office was meeting Wednesday with West Valley City police detectives about the fatal shooting in advance of a review of the officer-involved shooting. The DA will determine if the use of deadly force was legally justified. If they find it was not, criminal charges could be brought against Detectives Cowley and Kevin Salmon. Gill said Wednesday that WVCPD representatives were to meet extensively with his office on Wednesday and Thursday. "The goal is to provide WVCPD [the opportunity] to share their investigation with my senior staff. Once they have done so, we will start our review process," Gill said. "I suspect this will take some time depending upon what they provide. We want to be thorough." Last week, after remaining largely mute on details about the death of Willard, WVCPD released some details about the incident. Police said Willard was shot after allegedly backing her car into one of two officers investigating a purported drug deal that had just taken place. WVCPD says the officers had observed what they believed was a drug transaction between Willard and a man at a residence at 3644 S. 2200 West. Willard then pulled her car into a nearby vacant parking stall at the Lexington Park Apartments, 2292 Lexington Park Drive (3710 South). The officers approached on foot to make contact with Willard, who remained inside her vehicle, Detective Kevin Salmon from the front and Cowley from the rear. "When the detectives reached the vehicle and identified themselves as police officers, Ms. Willard put the vehicle in reverse and backed out of the parking stall," last week&apos;s WVCPD statement contended. "As this was occurring, Detective Cowley was struck by the vehicle and both Detective Cowley and Salmon fired their service weapons. Ms. Willard was struck and killed as a result of the gunfire." Willard&apos;s mother, Melissa Kennedy, said in the days after the shooting that her daughter was shot on the top of her head and had another wound on her chin. Kennedy saw her daughter&apos;s body after taking it home to Washington State for her funeral. 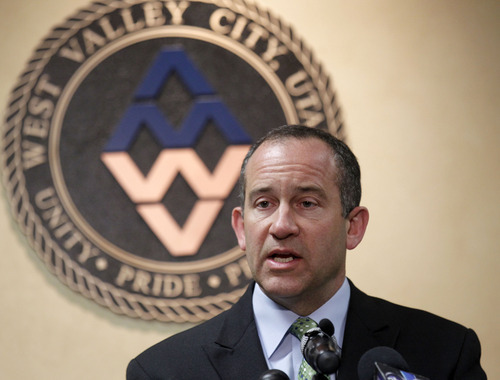 Pyle, who oversees the police department, said West Valley City police had been cooperating with the DA "from the very beginning" of the investigation and that the DA&apos;s investigators have had full access to the entire case. Pyle  countering an assertion made by an attorney representing Willard&apos;s mother  also stressed that no evidence connected to the shooting has been destroyed or lost. The attorney, Mark Geragos, in a March 11 letter to the police department, accused police of "a department wide cover up" of the Nov. 2 shooting of Willard, and that crucial surveillance video evidence had been destroyed because of a "mysterious" fire. "No evidence was destroyed in a fire," asserted Pyle, who did confirm that a carport near the scene did catch fire a few weeks after the shooting, but that it had no relation or effect on the case. Police also on Wednesday released a letter from Acting Chief Anita Schwemmer in response to Geragos that addresses the fire and other concerns. "No part of the facts, information or evidence found has been omitted," Schwemmer wrote in the March 26 letter. Pyle said his office agrees with concerns that were raised Tuesday by the West Valley City Council about the lack of strength of the department&apos;s Professional Standards and Review Board and about transparency in the department overall. He said he plans on looking at how his office can put new protocols in place to address those concerns. But Pyle stood by the police&apos;s handling of the investigation of Willard&apos;s death. "As far as the investigation goes itself  and how it was being conducted, and the professionalism and integrity of it  I&apos;m very happy with it," he said. Mayor Mike Winder said Wednesday that getting a new police chief creates an opportunity to set a new tone. He said the former chief, Thayle "Buzz" Nielsen, who retired effective March 8 for medical reasons, "had his strengths and his weaknesses" like all department heads. "I think we have a good opportunity to improve how we&apos;re communicating and to increase transparency," Winder said. The city is conducting a nationwide search and expects to have a new chief in place sometime in the summer, he said. WVCPD has declined to confirm that Cowley was the officer responsible for the cases being dismissed by Gill&apos;s office. However, the Fraternal Order of Police released a statement last week noting Cowley&apos;s name had been linked to the dismissed cases; the FOP expressed confidence that Cowley would be exonerated. The union also called for Gill to recuse himself from reviewing the shooting of Willard, as well from the 19 cases in question, and instead ask a DA from an adjoining county to investigate. Gill has rejected the demand. Throughout the recent developments and revelations, Gill has never publicly suggested that the shooting and the drug cases are related  and he has stressed that the investigation that led him to dismiss the cases was the result of a request to look into the cases that came from WVCPD itself. WVCPD Sgt. Jason Hauer said last week that problems with the 19 cases in question surfaced during a routine audit "a couple of months" ago. Tribune Reporter Pamela Manson contributed to this story.